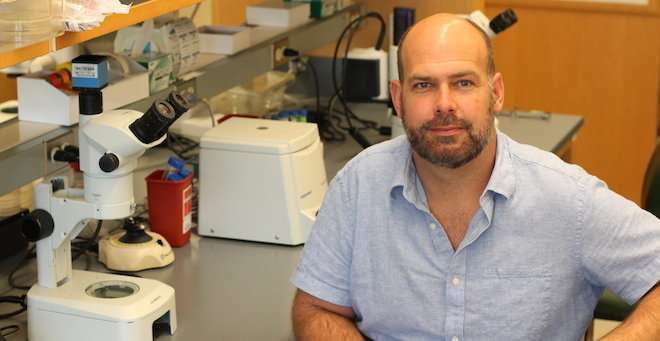 In a paper published Tuesday in the journal eLife, Michael Francis, PhD, and colleagues highlight a new role for the protein NRX-1, a synaptic organizer in the nervous system of the nematode C. elegans. Dr. Francis, associate professor of neurobiology, details how NRX-1, the nematode equivalent to the neurexin protein in mammals, must be present for the formation of synaptic connections between specific types of neurons. In addition, the researchers found that when NRX-1 is present, the protein encourages dendritic spine-like growths, similar to those in the human brain, to make these neuron-to-neuron connections. When the protein is absent, these partner-specific synaptic connections are not made. Francis hopes that the discovery will enable researchers to use the nematode to study the genes that control nervous system connectivity and spine outgrowth. Nematodes have a simpler nervous system than humans. Using the nematode could advance research capabilities that focus on whether neurodevelopmental and neuropsychiatric disorders, such as autism spectrum disorder, arise from defects in the establishment of connectivity in the developing brain. "We can use the experimental strengths of this simple system to identify novel mechanisms that are important for setting up connectivity. Knowing more about the connections enables us to now ask deeper questions about the processes underlying brain development," Francis said. Previously, scientists, using a mouse model, discovered that neurexin proteins promote synaptic connectivity, but their roles in this process have been incompletely understood. By attaching a green fluorescent protein to the receptors at C. elegans synapses, Francis was able to study individual synapses in the living worm and determine whether there are specific genes required to establish partner-specific connections. Francis and colleagues also saw that when NRX-1 is present, there is growth of dendritic spine-like structures that had not been previously demonstrated. This leads Francis to believe that neurexin might be involved in the growth in dendritic spines in the mammalian nervous system and that growing spines may be preferentially targeted to neurons that have neurexin. "This opens up the opportunity to use the less complicated nematode system to understand how dendritic spines grow in a well-defined, genetically tractable system," he said. Alison Philbrook, PhD, a recent graduate of the Neuroscience Graduate Program and former student in the Francis lab who is now a postdoctoral fellow in the laboratory of Piali Sengupta, PhD, at Brandeis University, is lead author on the study.